where y is the gross rental yield at equilibrium, g is the appreciation rate, i is the interest rate, τ is the holding tax rate, and k is the “capital-gain preference” — that is, the factor by which the tax system causes capital gains to be worth more than current income. The contours shown are y=i (the green/amber boundary) and y=0 (the amber/red boundary). Because equally spaced values of y give equally spaced contours, we can easily add contours for other values of y. 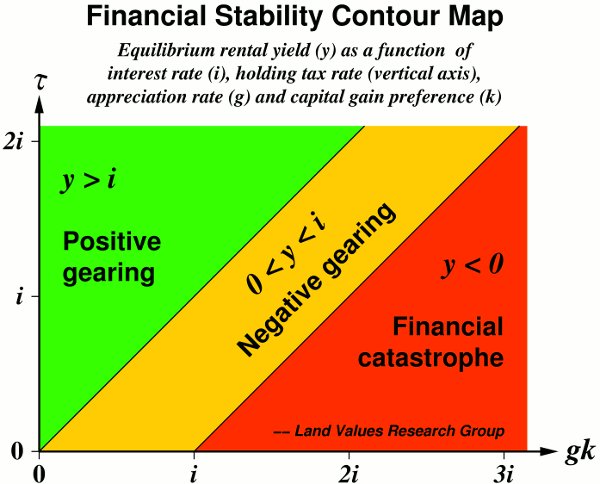 As we approach the red region — that is, as the “equilibrium” rental yield approaches zero — financial instability becomes inevitable. The contour map makes it clear that financial stability is improved by higher “land tax” (higher τ) and/or higher taxation of capital gains relative to current income and deductions (lower k). This concluding article considers the corresponding effects on the affordability of home ownership. (i+τ)/y = (i+τ) / (i+τ-gk) . If the market is rising (g>0) and capital gains are not completely confiscated (k>0), this ratio will be greater than 1 (that is, owning will be more expensive than renting). But higher “land tax” (bigger τ) and/or and higher taxation of capital gains relative to current income (smaller k) will increase i+τ relative to gk and therefore make the ratio closer to 1 (smaller). How can an increase in the holding tax make it cheaper to buy and hold the property? Obviously by reducing the price/rent ratio, which in turn affects not only the holding tax bill but also the interest bill. If the values of τ and k seen by prospective investors are different from those seen by prospective owner-occupants, as seems to be the case, this will influence their respective valuations and help to decide whether the highest rational bidder — or, as the case may be, the greatest fool — is more likely to be an owner-occupant or an investor. Higher “land tax” or higher capital-gains tax improves affordability in more obvious ways that are not explicitly modeled above. Either reform makes it less attractive to hold vacant land or boarded-up houses for speculative purposes, so that prospective home buyers have less competition from speculators. The same mechanism makes it more likely that unoccupied properties will be developed or renovated and offered to buyers and tenants, increasing the supply of housing, and tending to reduce not only prices but also rents. Higher taxation of capital gains, especially if extended to owner-occupants, will reduce the advantage of repeat buyers over first-time buyers (who have no capital gains to cash in), making it easier for first-timers to get into the market. Any increase or extension of “land tax” or capital-gains tax, if it is to be politically saleable, will need to be accompanied by immediate cuts in other taxes, increasing the spending power of tenants; and some of that increase will be competed away in higher rents. But because the same reforms will increase the supply of accommodation, not all of the increased spending power will be competed away, so tenants will be net gainers. If governments, through “land tax” or capital-gains tax, have a substantial stake in rising land values, they will have an incentive to invest in infrastructure that raises land values. But because this increase in value will reflect improved utility, and because (again) the increased supply of accommodation will improve the bargaining positions of renters and prospective buyers, the increase in value will not represent a loss of affordability. The effects of tax cuts and infrastructure, like those of more plentiful accommodation and an improved bargaining position for first-time buyers, are not explicitly modeled in the equations. But all concur with the equations in predicting that greater reliance on “land tax” and/or capital-gains tax would improve the affordability of housing.